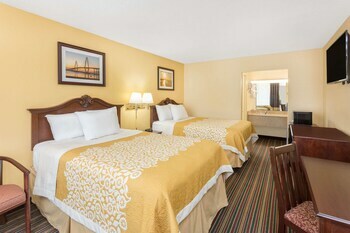 With a stay at Days Inn by Wyndham Mt Pleasant-Charleston-Patriots Point, you'll be centrally located in Mount Pleasant, a 5-minute drive from USS Yorktown and 10 minutes from College of Charleston. Featured amenities include a computer station, a 24-hour front desk, and laundry facilities. Free self parking is available onsite. When you stay at this condo in Seabrook Island, you'll be next to a golf course and 12 minutes by car from Bohicket Marina. When you stay at this vacation home in Kiawah Island, you'll be next to a golf course, within a 10-minute walk of Kiawah Beachwalker Park and Cougar Point Golf Course. With a stay at this condo in Kiawah Island, you'll be next to a golf course, a 4-minute walk from Night Heron Park and a 4-minute drive from Turtle Point Golf Course. When you stay at this vacation home in Isle of Palms, you'll be next to a golf course, within a 5-minute drive of Front Beach and Isle of Palms County Park. With a stay at this vacation home in Isle of Palms, you'll be next to a golf course, just a 1-minute walk from Front Beach and 14 minutes by foot from Isle Of Palms Recreation Center. With a stay at this vacation home in Isle of Palms, you'll be next to a golf course, just steps from Front Beach and a 3-minute drive from Isle of Palms County Park. When you stay at this condo in Seabrook Island, you'll be next to a golf course and 9 minutes by car from Bohicket Marina. When you stay at this condo in Seabrook Island, you'll be on the beach and 9 minutes by car from Bohicket Marina. When you a stay at this condo in Isle of Palms, you'll be next to a golf course, just steps from Isle of Palms County Park and Front Beach. Located in Isle of Palms, this condo is close to Isle of Palms Marina and Front Beach.